I spent two months here. The park is on main street and located convenient to shopping, restaurants and gas. Very reasonable rates. Full hookups for 30 and 50 amp. Roads and sites are gravel. Several large trees for shade. Sites are mostly level but could use some improvement. They have a tent area and nice recreation building. Laundry facility on site. The manager-owner is a great guy willing to help with any problems. The town is located within 25 miles of Bryce National Park with other parks in the surrounding area. Panguitch is a small country town with historic building. No major grocery stores. Two Walmarts one in Cedar City and one in Richfield both 75 miles one-way. The only issue I had was with the RV park Wi-Fi. Very weak especially when park has several travelers. Constantly on-off situation. Manager claims not his fault trying to get better service from companies in area. Also Verizon service is weak. I would definitely stay here again. We camped at Hitch-N-Post Campground in a Motorhome. Very nice people and extremely clean campground. Right on the road, so traffic noise was constant. The sites are super narrow but long so you have room from end to end. The owners are continually doing improvements, but one can't do much about the width. We camped at Hitch-N-Post Campground in a Motorhome. This campground knows how to greet their customer when registering! We had the best registration experience. The woman at the desk was welcoming and had lots of information about the area ready for us. She then walked us to our site to make sure it would work for us. The campground itself is no more than a gravel parking lot. The sites are small but have a picnic table and FHU. There is no cable but the internet was fast. Probably one of the best working internet connections we have had in the past three months. We camped at Hitch-N-Post Campground in a Fifth Wheel. Bathrooms have been cosmetically updated, but showers still take forever to receive hot water. Hosts were friendly. The only pull-through sites long enough for our motorhome with toad were in front, adjacent to the highway. Noise is not a problem at night, however. There were large trees on either side of our site and we would not have been able to open an awning, but not sure about slide-outs. Neighbor in a very large class A left his LED outside lights on all night, which was not very considerate. Close enough to town to walk to restaurants and a grocery store. We camped at Hitch-N-Post Campground in a Motorhome. A park in transition. There have been upgrades to power grid and the work is on-going. Sites are mostly easy to access. The pull thru sites are older with three sewer drop points, two power stanchions (one 30A and one 50A) one water supply. Staff was super helpful and friendly. The sites are gravel, fairly close to level but may require some minor adjustments. Panguitch is small town USA. Easy access for day trips to Bryce and Cedar Breaks, plus RED CANYON. OTA TV about 20 channels, otherwise satellite. CG is located on Main St, US-89, so expect some traffic noise. We had a pleasant stay and will return if in the area. We camped at Hitch-N-Post Campground in a Fifth Wheel. We did not pick this campground but out of necessity. We had some engine problems and had to park to camper to take the truck to a shop two doors north of the campground. The staff was sympathetic and help us a much as they could. He explained the small town of Panguitch Utah in high def detail, and then said he'd block off the site for 5 days if necessary until the truck was fixed. It was not a fancy place, but comfortable, clean, quiet, some trees and good access off the main road. I would stop here again. Plus the town is cute. We camped at Hitch-N-Post Campground in a Fifth Wheel. 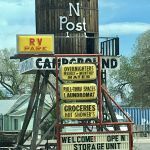 We were looking for a campground in the general area with full hook ups and internet and/or cell signal to re-provision and get caught up after 2 weeks of mostly boondocking. We're self contained and don't use the facilities except for an occasional shower. We stayed on a weeknight in mid-May. This CG met all of our needs. It's not a CG for views and pretty sites - it's solid and functional. The owners are friendly and helpful. The CG is clean and well maintained. The sites are small, level and fairly close together and all hookups worked well. The shower was clean with hot water. There's a usable wifi signal at the CG. There's good ATT and Verizon coverage. There's laundry at the CG. Although the sites are within a block of route 89, road noise at night was minimal. We camped at Hitch-N-Post Campground in a Motorhome. Owners are very friendly and helpful. It is an older park but the facilities are in great shape. Sites are a little tight but are long and level. Did not have any issue with getting our slides out. Electric was good, didn't use water or sewer. Outstanding Wi-Fi. We camped at Hitch-N-Post Campground in a Fifth Wheel. Rate reflects Good Sam discount. 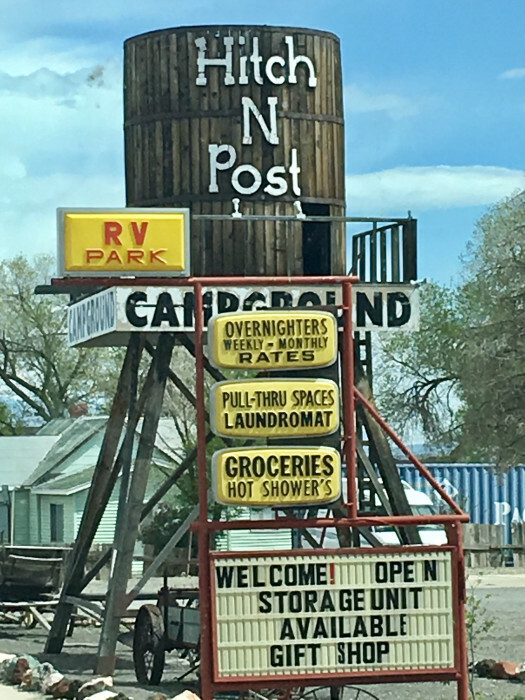 We stayed at this nice small park for 3 nights to see awesome Bryce Canyon National Park the campsite is in the town of Panguitch 6 miles from scenic Route 12. Although a small town, there is a good supermarket and diesel at very reasonable prices. Owners were very helpful and friendly. The site is open plan and all gravel but tidy. Restrooms are very clean but older style and a very large laundry. We had to sit in the comfortable chairs outside of the office to pick up WiFi as our site was to far from the antennae. On the last night when the campsite was almost empty we did get good connection from site. It is a more basic campsite than some but excellent value. We would certainly recommend staying here. We camped at Hitch-N-Post Campground in a Fifth Wheel. Nice little park. Friendly owners. Not the cleanest, with some debris around the garbage area. Cute little town close enough the Brice Canyon for day trips. I would try a different park if in the area again. We camped at Hitch-N-Post Campground in a Fifth Wheel. Attitude makes up for a lot, and the staff at the desk whom we saw frequently after checking in were cordial, informative, and pleasant to chat with. Even offered us cold beverages after we pulled in during the heat of the afternoon. The store offers a little bit of this and that in the way of RV supplies as well as the obligatory tourist t-shirts, hats, etc. Just a couple of small but clean restroom/shower combos immediately adjacent to what appeared to be a couple/few living quarters with folks coming and going at all hours. Can't miss the wooden water tank out front and it makes a quaint picture. Good for an overnight stay. We camped at Hitch-N-Post Campground in a Motorhome. Very helpful staff. We were there during a windy period which made our site very dusty given the gravel surface of this park. Would use the facility again however if passing near. Wi-Fi was excellent which is important to us. We camped at Hitch-N-Post Campground in a Motorhome.